Next of kin: Mrs. Elizabeth. Kearney, mother, Tullamore, NSW & Sarah Gertrude MATTHEWS – wife, Church St, Gloucester. Buried at: No.1 Shell Green Cemetery, Plot 1, Row B, Grave 9, Gallipoli Peninsular. 2nd Lieutenant Alexander Frank BUSKIN, 6th LHR. Killed in action at Bolton’s Ridge, 17/09/1915. Trooper William Bradley INGRAM, 6th LHR. Killed in action 17/09/1915. Trooper Frank Walter MATTHEWS, 6th LHR. Killed in action 17/09/1915. Trooper Lyle Hugh Florian O’NEILL, 6th LHR. Killed in action 17/09/1915. Captain Rupert Noel RICHARDSON, 6th LHR. Killed in action 17/09/1915. Trooper David Matthew JACOMBS, 7th LHR. Killed in action 17/09/1915. Trooper Ernest Ambrose ROBERTS, 7th LHR. Killed in action 17/09/1915. Just as an aside, his wife applied for a pension in 1918 and was granted a pension for herself and their son, also named Frank Walter Mathews. Frank (Jr) was born in 1915 in the East Maitland District (NSW BDM). At this stage there is no death record of Frank (Jr). Frank (Sr) enlisted 18/09/1914, killed 17/09/1915 – 364 days. Without getting a birth certificate for Frank (Jr) it is not known whether he was born just before or after Frank (Sr) was killed. 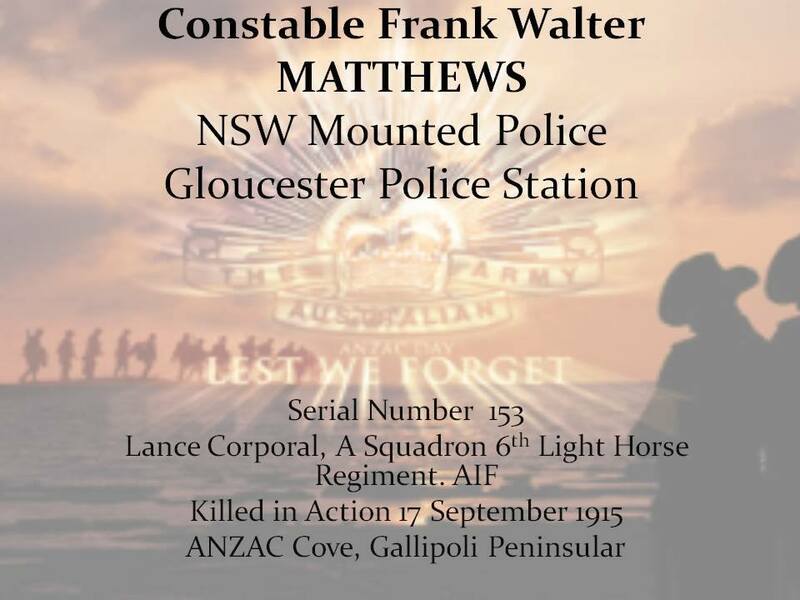 The below link, from the NSW Government Employees Granted Military Leave, 1914 – 1918 has F. W. MATTHEWS, Ordinary Constable of Gloucester; North Eastern District, Gloucester Station, being KILLED in Action at Gallipoli on the 6 September 1915 – being a conflicting date of death from that of the Light Horse.org.au website. The below Citation comes from NRS 4481 Glass negatives ( NRS4481_ST6724P ), plus NRS 10946 Police salary registers [3/2995], SR Reel 1974, plus Police Department Annual Report for the year 1915, in Parliamentary Papers 1915-16, Vol.4, p.635, plus Police Department Annual Report for the year 1918, in NSW Parliamentary Papers 1919, Vol.3, p.603, plus Police Department Annual Report for the year ended 1917, in NSW Parliamentary Papers 1918, Vol.3, p.665.